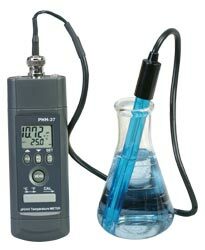 The PHH-37 is a portable pH/mV and temperature meter with an easy-to-read digital display. Its temperature compensation feature enables it to read solutions at various temperatures. Temperature compensation can be adjusted manually, or it may occur automatically when the temperature sensor is immersed in a solution. Please order pH electrodes separately.